As you are probably aware the SPY (the markets as a whole) had been on a historic run starting in early 2016 which persisted through January of this year, when we experienced some of the biggest selloffs in market history. The SPY began to rebound earlier this month, and was making a pretty good run at a recovery until yesterday brought another significant backslide. Despite yesterday’s hiccup, the SPY has been in a general uptrend for the last couple of weeks, and today, it looks like we could resume the path toward ascension. We’ll be ;looking for the markets to go green today, which could produce some notable opportunities in the SPY 02/28 $275-276 Calls*. *Please note that these contracts expire today, thus the associated risk is that of trading weekly options on a Friday. It should never be attempted unless you are an expert level trader with disposable funds. TJX is exhibiting a considerable surge in premarket trading today. Despite missing EPS estimates in their Q4 earnings call, the stock is gapping up to the tune of 8% this morning. When we see a monster gapper like this, we generally look to signal a range of options calls that will come into play in a dip-and-rip scenario, which are quite common in instances such as these. We will be tracking the TJX 03/16 $80-85 Calls. 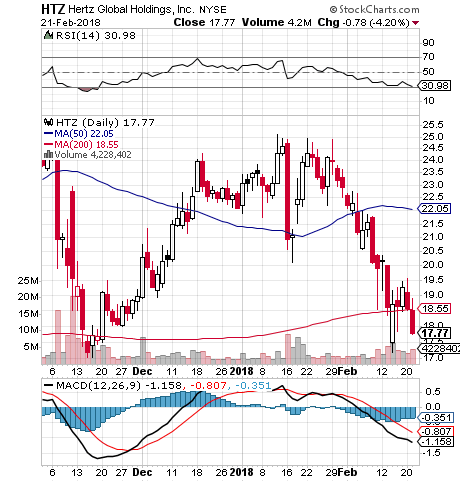 Back on February 12th, we flagged Ford as a bottom watch play after the company got off to a bad start in 2018. It had just begun to show signs of life, so we formulated an options idea to help us take advantage of the scenario. Our targets were the F 03/02 10.37-11.37 Calls and we’ve seen some solid opportunities from three of the four contracts in that range in the two weeks since our alert. Yesterday morning we saw an opportunity to select a range of calls in the Target options chain, and decided to focus on the TGT Weekly $75-76.50 Calls for a fresh options idea. It was an immediate success, with TGT trading up enough to produce some really nice single-session swings. We also want to put DF on our watchscreens as a bottom-watch play. The stock got absolutely crushed as a result of missed earnings and revenue estimates in its Q4 report, along with a downgrade by Credit Suisse. These events have driven DF into heavily oversold territory, registering a new 52-week low. The stock also has a history of relatively volatile swings, so we’re going to watch closely for the beginnings of a bottom bounce in sessions ahead. It may have further to fall, but we’ll be looking for that rebound.